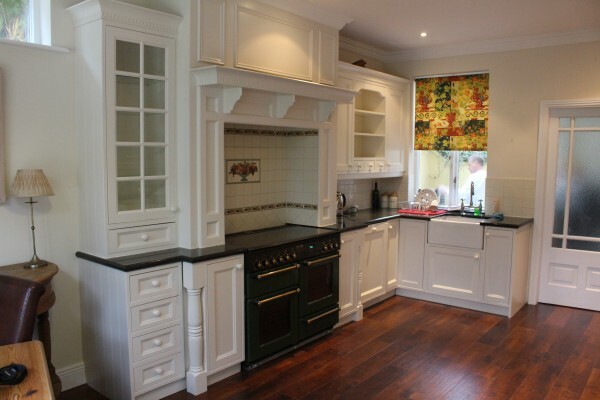 Hand painted kitchen in Howth, Co.Dublin. 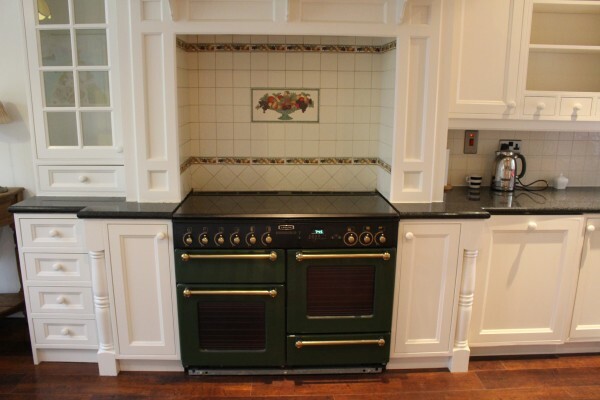 We received a call from a home owner in Howth, Co. Dublin inquiring about having their handmade kitchen hand painted. 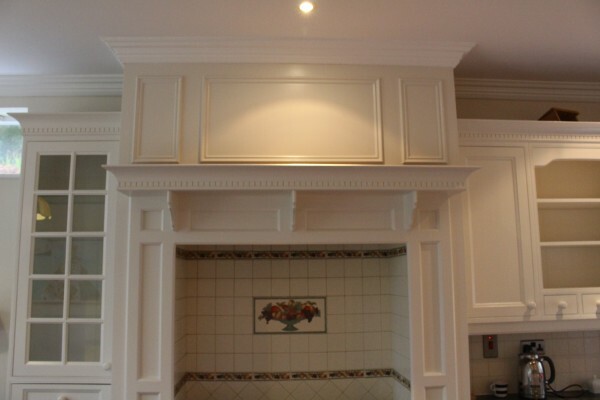 The kitchen had been installed 20 years ago by a master cabinet maker who has since retired. It had been hand painted when it was installed by a couple of excellent painters, they had achieved a flawless finish and they are also retired now too. 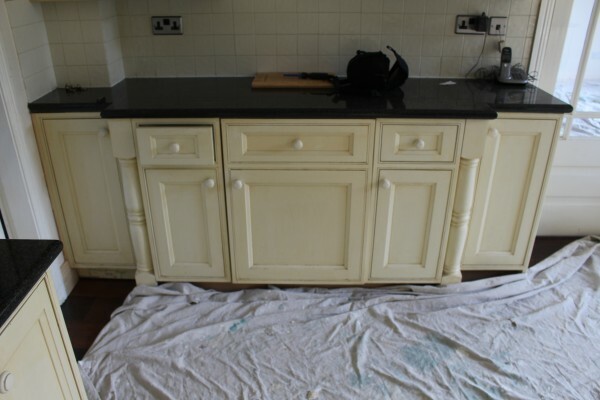 This left the kitchens owner in a bit of a fix, when it comes time to get the finish you would expect in a hand painted kitchen, who do you call? Its one thing to have a handy man available that can paint your garden wall and do a few bits and pieces here and there but you wouldn’t ask a handyman to have a go at a hand painted kitchen, unless of course you really aren’t that fussy! I made an appointment to see the kitchen and once there went through the system we use to achieve the best results. I also went through all the options with materials and all the different types of brands, explaining the pro’s and con’s of each. Once the customer had all the information they were then able to decide on what was going to be best for them. They decided on an eggshell finish in an antique white. 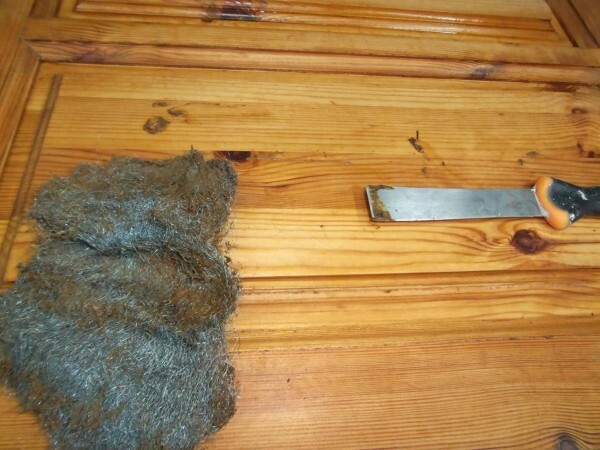 Once the cleaning was complete everything received a good rub down with a low grade sandpaper. After that the cabinets were dusted, vacuumed, wiped clean with tack clothes and then wiped down one last time with some new lint free clothes and methylated spirits. This gave us the perfect surface for the fist coat of eggshell. Back at the workshop all the doors, drawers and door knobs too were given a deep clean using Krud Kutter. Krud Kutter is a degreaser that really works well. 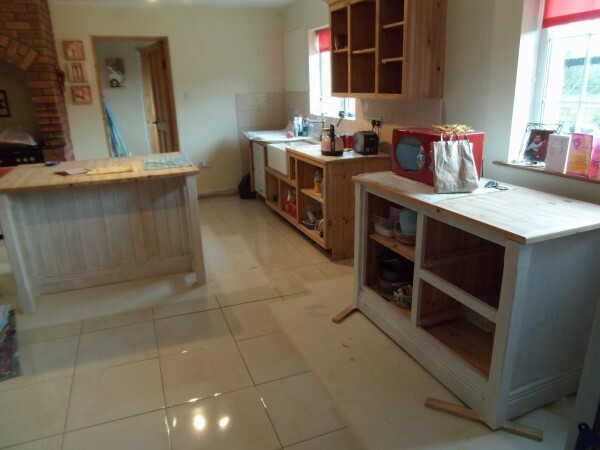 Once clean everything went through the same process as the kitchen carcasses. 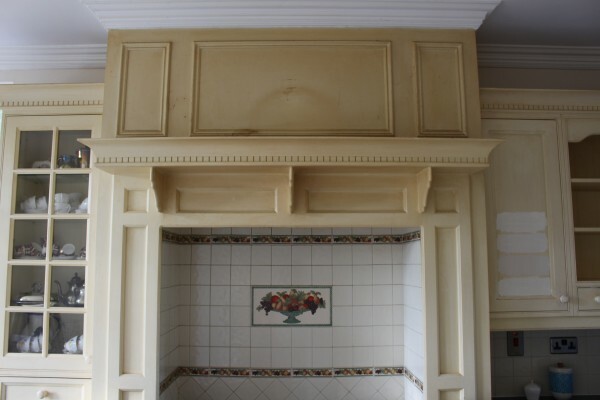 Then everything received two coats of eggshell in Antique White. 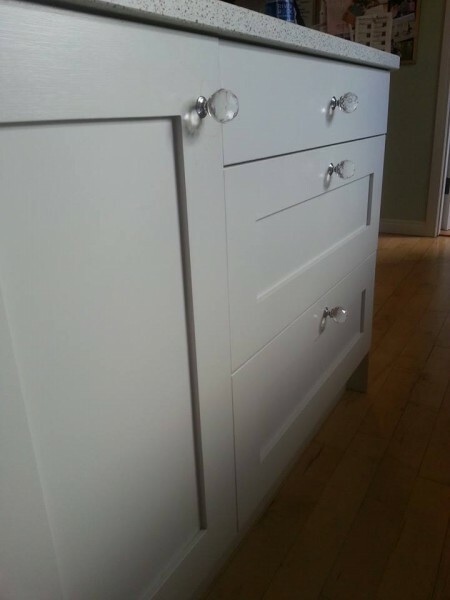 They were given one coat on the Tuesday, One coast on the Wednesday, they were left to cure on the Thursday and on the Friday the doors, drawers and knobs made there return to the kitchen. The carcasses had been finished prior to returning with the doors etc. The kitchen was reassembled and finishing touches were added here and there. The ceiling, walls and woodwork were also painted to give the whole room a fresh new look. When the customer got to see the finished article she was indeed very very happy with the results. 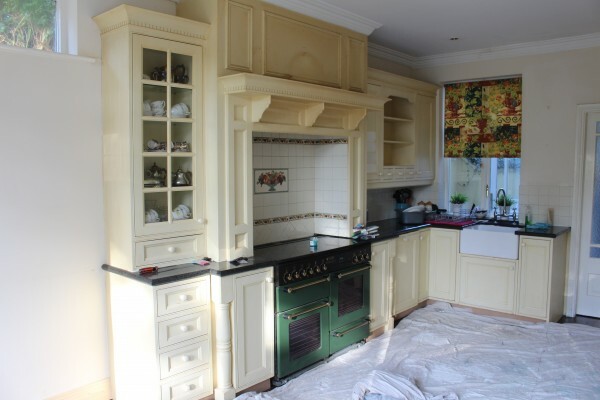 If you would like a hand painted kitchen then get in touch with the kitchen painters at kitchenpainters.ie! 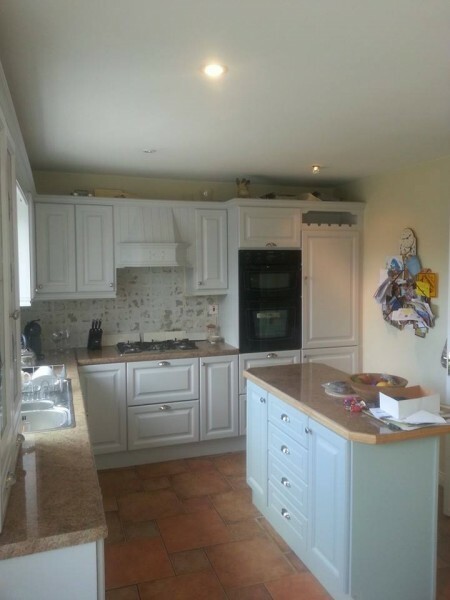 This work was carried out by Oisin Butler Ltd, a member of kitchenpainters.ie. 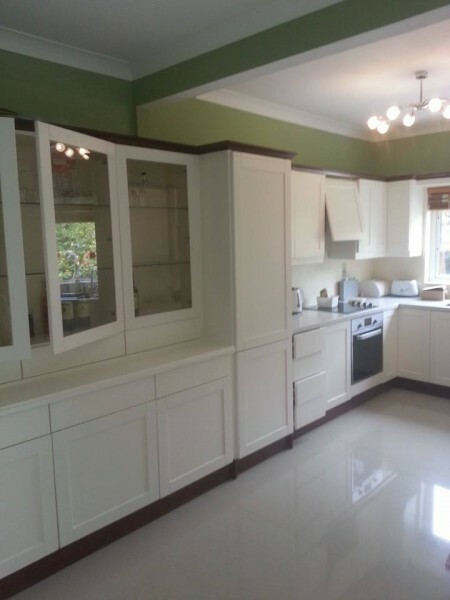 Conclusion – If you would like your kitchen to be a hand painted kitchen like this then get in touch with the experts at kitchenpainters.ie, nation wide service! How to paint waxed wood etc by Eddie Art Hand Painted Furniture & Interior Décor. 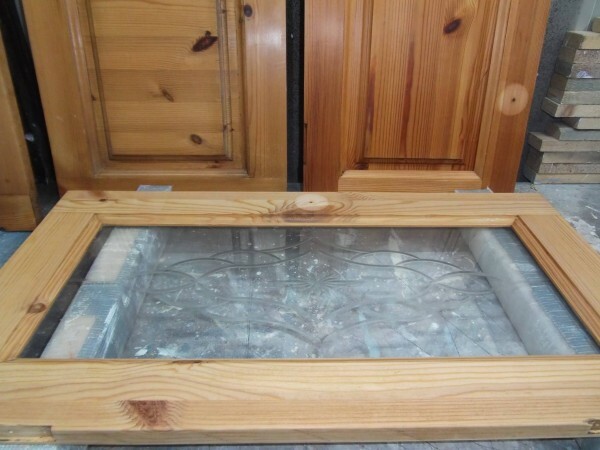 If you want to paint waxed wood, whether its furniture or kitchen cabinets, there is a process that needs to be followed in order to achieve a high quality, long lasting finish. 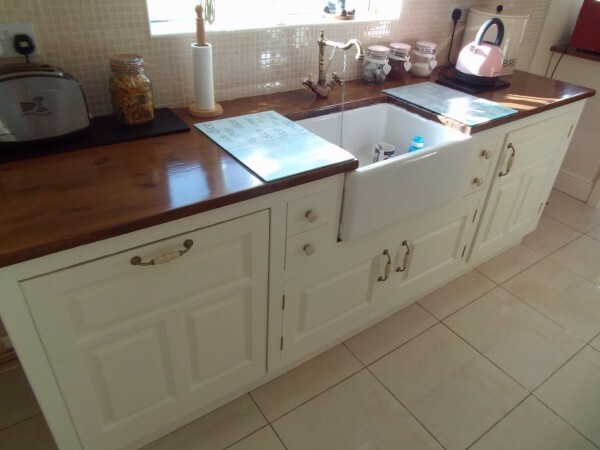 This is a kitchen that was painted for a client that came to me via my FB business page who in turn had come to me via Kitchenpainters.ie This is a 13 year old waxed kitchen that my client had looked at by a painter who spray’s kitchen’s and was told it cannot be painted because it’s waxed, the customer asked me ‘can you paint waxed wood?’ I can, it just need’s to be de waxed first! On my 1st visit I explained and gave a small demonstration as to how to remove the wax, this is what we must do in order to paint waxed wood, then I explained The Process with regard’s to what happens to the kitchen leading right up to the finished look, I then priced the kitchen and on agreement a date was set. The Process was all door’s and draws removed and taken to workshop, they then undergo a deep cleaning and de waxing process then all door’s etc are sanded smooth ready for the next stage. As this is a knotty solid hand made pine kitchen, this was then given two good coat’s of Zinsser bin a shellac primer sealer which give’s me my basecoat for following top coat’s it also seal’s the knot’s all in one go, once this is done then I hand sanded the basecoat hoovered and then wipe over with a tack cloth to remove all fine dust that hoovering cannot remove alone. 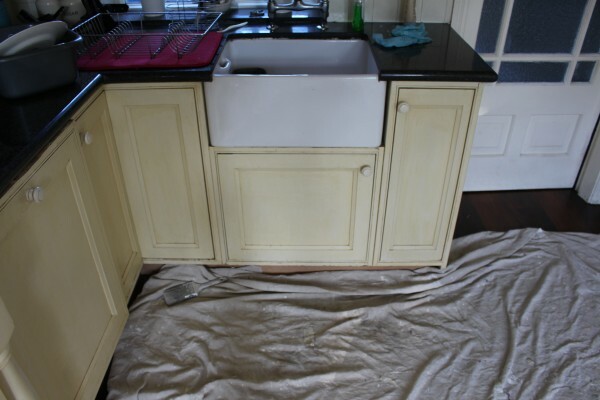 Next stage was 3 top coat’s were applied, on this occasion Tikkurila helmi matt 10 mixed to the equivilant of White Tie and Ball Green were used for the finish with a light finish sand between coat’s. which in turn had 2 coat’s of Sadolin extra wood stain applied in African Walnut this was then sand sealed then sanded smooth and finished with 3 coat’s of Tikkurila Kiva Lacquer. 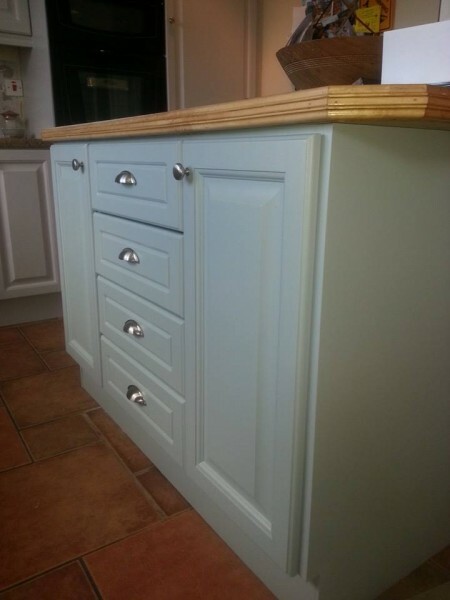 The end result was a kitchen that look’s brighter and more interesting to the eye also new handle’s were re positioned and fitted and contributed to the finished look. 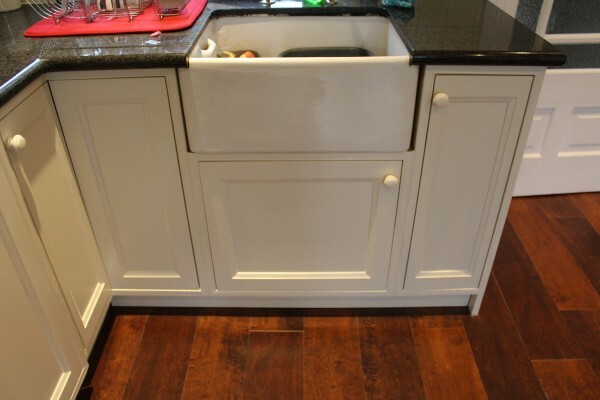 To buy this kitchen brand new from a kitchen shop would cost a small fortune, for a fraction of the cost it can be de waxed and hand painted. How to paint waxed wood, kitchen cabinets – conclusion. If you would like to know more about this process then please get in touch today, remember to like our Facebook page too! Paul Hanley painting & decorating is the newest member of kitchenpainters.ie. Paul is based in Baile liam. 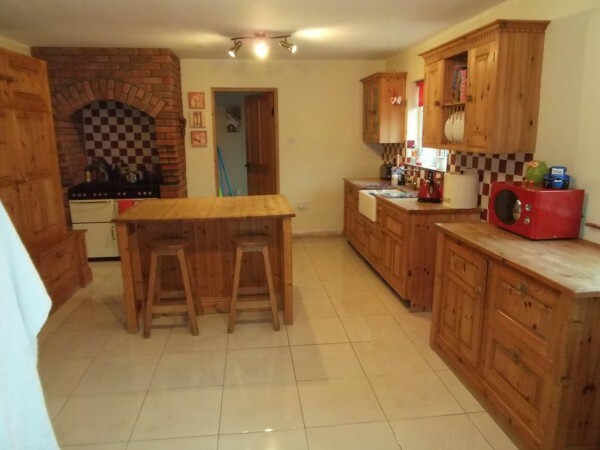 Spiddal, Co. Galway and is happy to arrange a home or site visit and will provide you with the best possible advice concerning your kitchen or fitted furniture. 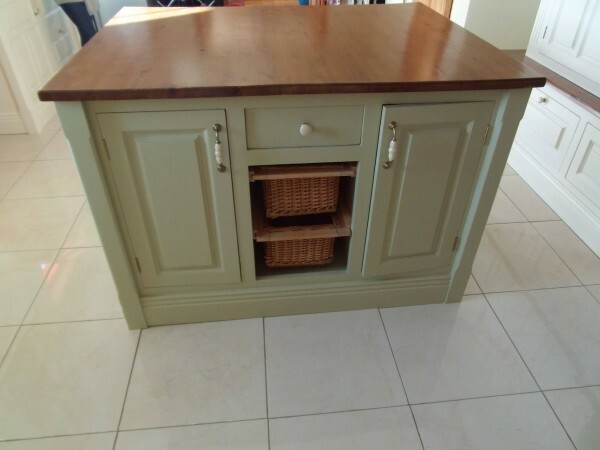 Paul is a master when it comes to hand painted furniture and has years of experience transforming kitchens and furniture for customers all over Galway. Paul has lots of experience with all the different varieties of paint brands and finishes and he will recommend the best product and finish for your kitchen and furniture. 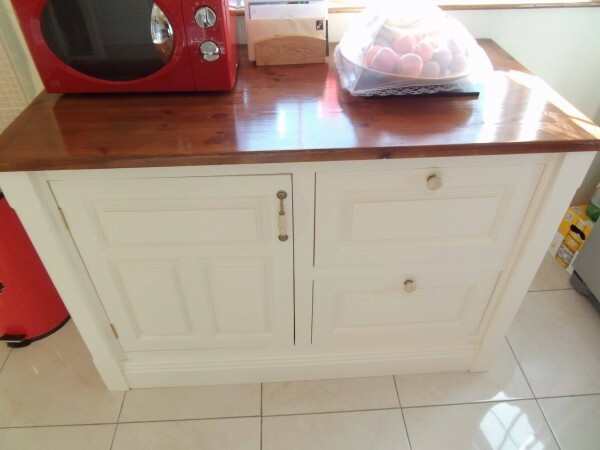 If you are living in or around Galway and would like your kitchen cabinets transformed by an expert then look no further! 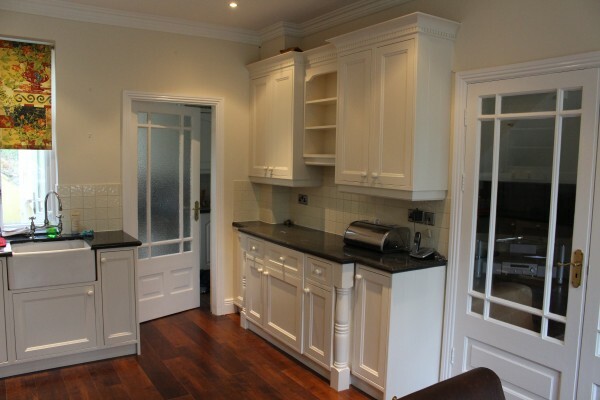 Paul Hanley Painting & Decorating, a member of Kitchenpainters.ie.